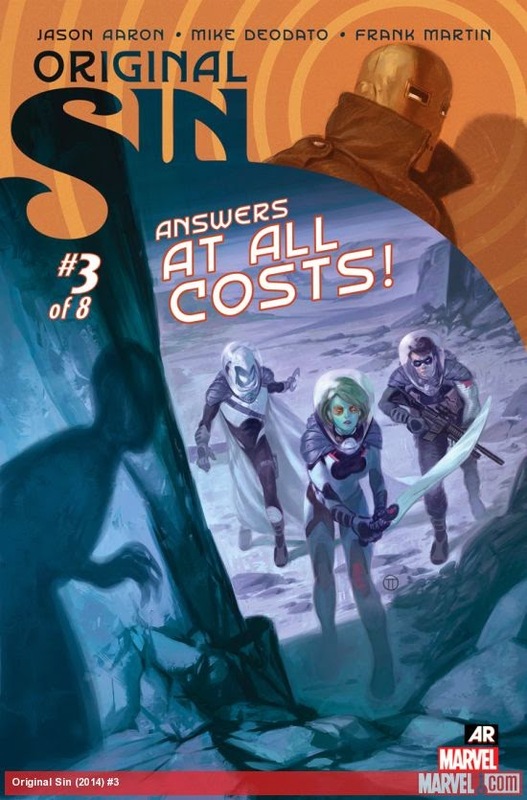 Matt C: When you look at the creative team, the publisher and the concept, it would be fair to say that Original Sin #3 should be overshadowing everything else this week. Based on the preceding two issues, while not out of the question, it's looking unlikely. It's been merely good when it should be great. Yes, these event books usually skimp on character in favour of spectacle, but that's not always the case, and even if it is there's something to be said for grand spectacle delivered with confidence and expertise. The art from Mike Deodato has been terrific though and I'm sure Jason Aaron has a few tricks up his sleeve. It's too early to write this one off yet! One book I certainly won't be writing off is Magneto #5. Yes, I wasn't onboard from the beginning, but the chorus of praise that followed it around since its launch has been too hard to ignore. I've now caught up on the first four issues and I can see clearly what all the fuss was about. Avengers World #6 was my surprise 'Book of the Week' a couple of weeks back - I'm not convinced #7 will repeat the trick but it's definitely had a stay of execution on my pull-list. After many weeks of taking a vast chunk of my weekly stack, I'll only be taking home one Image comic on Wednesday: Nailbiter #2. The debut was another winner from the publisher and I expect big things from the sophomore effort. Stewart R: You just listen to the Paradox Comics Express and take his advice, on a stormy, wet Wednesday, when the lightning's crashin', the thunder's roarin', and the rain's coming down in sheets as thick as a Marvel Essential collection. Remember what old Stewart R does when the earth shakes and the poison arrows fall from the sky and the pillars of your local comic book store shake. Yeah, Stewart R just looks that big old storm right in the eye and he says "Gimme your best copy of the Big Trouble In Little China comic pal, I can take it!" Suffice to say I'm REALLY looking forward to picking up Eric Powell and Brian Churilla's Big Trouble In Little China #1 from BOOM! Studios this week! The story kicks off right where the film ended with Jack in the Porkchop Express and a monstrous stowaway lurking in the shadows of the big rig, ready to do who-knows-what to our loud-mouthed, cocky hero. The preview pages already had me genuinely laugh out loud once so I'm anticipating entertaining things indeed with this series. Elsewhere around the delivery I'm eager to get my hands on both of Vertigo's efforts in the shape of Hinterkind #8 and The Wake #9 while, in a big week Marvel-wise for me, Nick Spencer and Steve Lieber's Superior Foes of Spider-Man #12 stands head and shoulders above the rest purely because we're back to the main story and that previous cliffhanger from #9 involving this bumbling incarnation of the Sinister Six and a busload of school kids. Fun will be in abundance I'm sure.